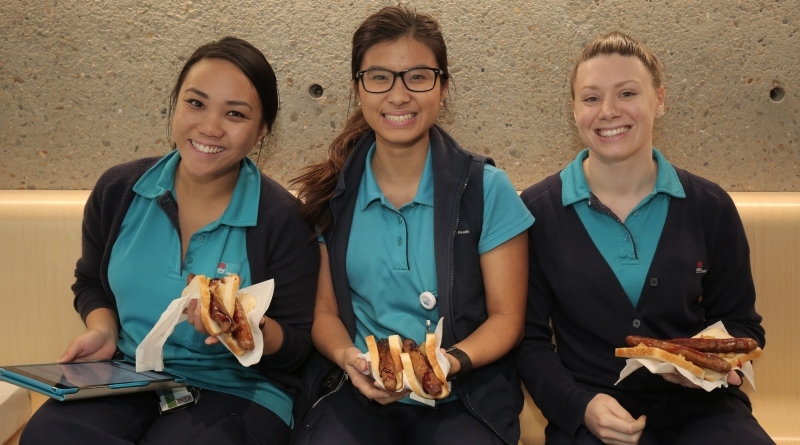 Erica Maqruez, Belinda Lu and Sohpia Melman enjoy a barbecue lunch at Westmead. Directors and managers have donned aprons and picked up barbecue forks and tongs to serve our staff. Barbecues and afternoon teas were held across our hospitals and community health centres to show that People Matter and give staff an opportunity to complete the survey. This is the final week, and 22% of our staff have completed the People Matter survey so far. “We have now reached last year’s response rate, but are aiming even higher – 40%,” said Robynne Cooke, Executive Director Operations. “A high participation rate will provide us with strong data for making improvements.” she said. Mount Druitt Hospital is nearly there, with 39% of staff having their say. WSLHD Corporate and Integrated and Community Health are also both doing well with 28%. Find out how your facility or service is tracking on the intranet page. If you have not already, complete the survey online this week to make sure your views are counted. The People Matter NSW Public Sector Employee Survey closes next Monday 2 July. Auburn Hospital staff complete their People Matter survey over lunch. Registered nurse Serap Grabul gets the barbecue lunch ready at Westmead. Social workers Christine Vo, Ana Costa, Cassandra Barducci and Charlotte Miles complete their survey online. Staff at Blacktown Hospital show their support for the People Matter Survey.